A gold coin is a coin that is made mostly or entirely of gold. Most gold coins minted since 1800 are 90–92% gold (22 karat), while most of today's gold bullion coins are pure gold, such as the Britannia, Canadian Maple Leaf, and American Buffalo. Alloyed gold coins, like the American Gold Eagle and South African Krugerrand, are typically 91.7% gold by weight, with the remainder being silver and copper. 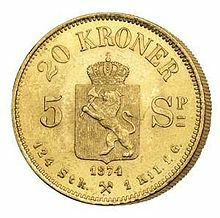 Traditionally (up to about the 1930s), gold coins have been circulation coins, including coin-like bracteates and dinars. Since recent decades, however, gold coins are mainly produced as bullion coins to investors and as commemorative coins to collectors. While modern gold coins are also legal tender, they are not observed in everyday financial transactions, as the metal value normally exceeds the nominal value. For example, the American Gold Eagle, given a denomination of 50 USD, has a metal value of more than $1,200 USD. The gold reserves of central banks are dominated by gold bars, but gold coins may occasionally contribute. Gold has been used as money for many reasons. It is fungible, with a low spread between the prices to buy and sell. Gold is also easily transportable, as it has a high value to weight ratio, compared to other commodities, such as silver. Gold can be re-coined, divided into smaller units, or re-melted into larger units such as gold bars, without destroying its metal value. The density of gold is higher than most other metals, making it difficult to pass counterfeits. Additionally, gold is extremely unreactive, hence it does not tarnish or corrode over time. Gold was used in commerce (beside other precious metals) in the Ancient Near East since the Bronze Age, but coins proper originated much later, during the 6th century BC, in Anatolia. The name of king Croesus of Lydia remains associated with the invention (although the Parian Chronicle mentions Pheidon of Argos as a contender). 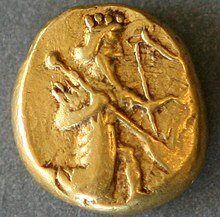 In 546 BC, Croesus was captured by the Persians, who adopted gold as the main metal for their coins. The most valuable of all Persian minted coinage still remains the gold drams, minted in 1 AD as a gift by the Persian King Vonones Hebrew Bible new testament (Matthew 2.1–23). Ancient Greek coinage contained a number of gold coins issued by the various city states. The Ying yuan is an early gold coin minted in ancient China. The oldest ones known are from about the 5th or 6th century BC. Larger units such as the various talent measures (26 to up to 60 kg) were used for high value exchanges (similar to today's 400-troy-ounce (12.4 kg) "good delivery" gold bullion bar). The German gold mark was introduced in 1873 in the German Empire, replacing the various local Gulden coins of the Holy Roman Empire. Gold coins then had a very long period as a primary form of money, only falling into disuse in the early 20th century. Most of the world stopped making gold coins as currency by 1933, as countries switched from the gold standard due to hoarding during the worldwide economic crisis of the Great Depression. In the United States, 1933's Executive Order 6102 forbade the hoarding of gold and was followed by a devaluation of the dollar relative to gold, although the United States did not completely uncouple the dollar from the value of gold until 1971. Gold-colored coins have made a comeback in many currencies. However, "gold coin" (in numismatic terminology) always refers to a coin that is (more or less) made of gold, and does not include coins made of manganese brass or other alloys. Furthermore, many countries continue to make legal tender gold coins, but these are primarily meant for collectors and investment purposes and are not meant for circulation. Many factors determine the value of a gold coin, such as its rarity, age, condition and the number originally minted. Most gold coins minted since the late 19th century are worth slightly more than spot price, but many are worth significantly more. Gold coins coveted by collectors include the Aureus, Solidus and Spur Ryal. In July 2002, a very rare $20 1933 Double Eagle gold coin sold for a record $7,590,020 at Sotheby's, making it by far the most valuable coin ever sold up to that time (a 1794 Flowing Hair Dollar sold for over $10 million in January 2013). In early 1933, more than 445,000 Double Eagle coins were struck by the U.S. Mint, but most of these were surrendered and melted down following Executive Order 6102. Only a few coins survived. In 2007 the Royal Canadian Mint produced a 100 kilograms (220 lb) gold coin with a face value of $1,000,000, though the gold content was worth over $2 million at the time. It measures 50 centimetres (20 in) in diameter and is 3 centimetres (1.2 in) thick. It was intended as a one-off to promote a new line of Canadian Gold Maple Leaf coins, but after several interested buyers came forward the mint announced it would manufacture them as ordered and sell them for between $2.5 million and $3 million. As of May 3, 2007, there were five orders. One of these coins has been stolen when it was on exhibition at the Bode Museum in Berlin. Austria had previously produced a 37 centimetres (15 in) diameter 31 kg Philharmonic gold coin with a face value of €100,000. On October 4, 2007, David Albanese (president of Albanese Rare Coins) stated that a $10, 1804-dated eagle coin (made for President Andrew Jackson as a diplomatic gift) was sold to an anonymous private collector for $5 million. In 2012 the Royal Canadian Mint produced the world first gold coin with a 0.11–0.14ct diamond. The Queen’s Diamond Jubilee coin has been crafted in 99.999% pure gold with a face value of $300. Portuguese Gold Coin, sixteenth century. Precious metals in bulk form are known as bullion, and are traded on commodity markets. Bullion metals may be cast into ingots, or minted into coins. The defining attribute of bullion is that it is valued by its mass and purity rather than by a face value as money. While obsolete gold coins are primarily collected for their numismatic value, gold bullion coins today derive their value from the metal (gold) content – and as such are viewed by some investors as a "hedge" against inflation or a store of value. Many nations mint bullion coins. According to British HM Revenue & Customs investment coins are generally coins that have been minted after 1800, have a purity of not less than 900 thousandths, or have been legal tender in its country of origin. Although nominally issued as legal tender, these coins' face value as currency is far below that of their value as bullion. The European Commission publishes annually a list of gold coins which must be treated as investment gold coins in all EU Member States. The list has legal force and supplements the law. In the United Kingdom, HM Revenue and Customs have added an additional list of gold coins alongside the European Commission list. These are gold coins that HM Revenue & Customs recognise as falling within the exemption for investment gold coins. This second list does not have legal force. South Africa introduced the Krugerrand in 1967 to cater to this market; this was the reason for its convenient and memorable gold content – exactly one troy ounce. It was the first modern, low-premium (i.e. priced only slightly above the bullion value of the gold) gold bullion coin. Bullion coins are also produced in fractions of an ounce – typically half ounce, quarter ounce, and one-tenth ounce. Bullion coins sometimes carry a face value as legal tender. The face value is minted on the coin, and it is done so in order to bestow legal tender status on a coin, which generally makes it easier to import or export across national borders, as well as subject to laws against counterfeiting. However, their real value is measured as dictated by their troy weight, the current market price of the precious metal contained, and the prevailing premium that market wishes to pay for those particular bullion coins. The face value is always significantly less than the bullion value of the coin. Legal tender bullion coins are a separate entity to bullion gold. One enjoys legal tender status, the latter is merely a raw commodity. Gold has an international currency code of XAU under ISO 4217. ISO 4217 includes codes not only for currencies, but also for precious metals (gold, silver, palladium and platinum; by definition expressed per one troy ounce. Gold bullion coins usually come in 1 oz, 1/2 oz, 1/4 oz, 1/10 and 1/20 oz. sizes. Most countries have one design that remains constant each year; others (such as the Chinese Panda coins) have variations each year, and in most cases each coin is dated. A 1/10 oz bullion coin is about the same size as a U.S. dime. A 1 oz. gold bullion coin is about the size of a U.S. half dollar. The largest legal tender gold coin ever produced was unveiled in 2012 by the Perth Mint in Western Australia. Known as the "1 Tonne Gold Kangaroo Coin" and with a face value of one million dollars, it contains one metric tonne of 9999 pure gold, and is approximately 80 cm in diameter by 12 cm thick. Circulating gold coins were usually made of an alloy as other metals are mixed into the coin to make it more durable. Fineness is the actual gold content in a coin or bar and expressed as a "per mil", or thousandths. For example, a gold ingot identified as being .999 fine will be 999/1000 pure gold, with the other 1/1000 being impurities. Karat weight (K or kt) is a traditional fraction-based system used to denote the fineness of gold, with one karat being equal to 1/24 part of pure gold in an alloy. With the precision of modern assaying techniques, however, the fineness of gold ingots and bullion is more likely to appear as a decimal measurement. In this system, pure gold would be denoted as 1.000 fine. However, since absolutely pure gold is very soft and therefore not suitable for coinage or ingots, it is generally accepted worldwide that anything above .999 fine qualifies as 24K. Below is a karat weight to fineness conversion chart. The fineness is often converted to a percent, as well. If a gold coin has a fineness of .900, that is 90.0% pure gold. If a gold coin has a fineness of .850, then the gold coin is 85.0% pure. Coins have varied greatly in fineness through history. Notable historical standards that were closely adhered-to include the crown gold (22 karat) used in all English gold coins intended for circulation from 1526 onward, and 0.900 fine (21.6 kt), the standard for all American circulation-coins from 1837 onward. Fineness is not the only way to value a gold coin; a great deal of value in collector coins comes from condition and rarity. To a far lesser extent, even the value of gold bullion coins is influenced by their physical condition. A coin's "grade" is a visual evaluation of the amount of wear on a coin. Coins with little wear are graded higher and therefore assigned higher prices than those with a lot of wear. However, low-grade, extremely rare coins can easily be more valuable than more widely available, higher grade coins of common dates. As the collector market for coins grew rapidly in the late 19th century and early 20th century, it became apparent that a more precise grading standard was needed. Some coins were simply more fine than others, and some uncirculated coins showed more luster and far fewer marks than others. Terms like "gem uncirculated" and "very fine" began to see use, as more precise grading descriptions allowed for more precise pricing for the booming collector market. In 1948, a well-known numismatist by the name of Dr. William Sheldon attempted to standardized coin grading by proposing what is now known as the Sheldon Scale. Sheldon's scale, included in his famous work Penny Whimsy, was originally devised specifically for United States large cents, but it is now applied to all series. The scale runs from 0 to 70, where 0 means that you can tell that it was once a coin while 70 means that it is perfect. 60 is uncirculated, what the general public would consider perfect, with no wear whatsoever. There is a direct mapping from this scale to the older descriptive terms, but they are not always used in the same way. Below are the general characteristics that define different coin grades in the United States system. When grading coins, any defect should be noted, such as bent, scratched, etc. Cleaning or mutilations of any kind should be mentioned. Basal or Poor - (PO1) A piece of metal that can be identified as a coin. Fair - (FR2) The type of coin can be identified, the date may or may not be visible. About Good - (AG3) The date can be read, but parts of the coin and legend are worn smooth. Good – (G4 and G6) Legends, designs and dates are visible but heavily worn. Very Good – (VG8 and VG10) Designs and date are clear but lacking details. The "full rim" (the line around the edge of the coin where it was raised up) must be visible. Fine – (F12 and F15) All major details will be visible with the major details virtually complete. In this case, "Fine" describes concerning the condition of the coin – not the purity as described above. Very Fine – (VF20, VF25, VF30, and VF35) More details are visible with major details virtually complete. Extremely Fine (XF or EF) – (EF40/XF40 and EF45/XF45) Light wear on the high points with some mint luster present. Almost Uncirculated (AU) – (AU50, AU53, AU55, and AU58) Small trace of wear visible on the highest points with at least half of the mint luster still present. Uncirculated (UNC) or Mint State – (MS60 through MS70 inclusive) No trace of wear with some small nicks or marks present. Proof – (PR or PF; numerical designation typically between 40 and 70). Coins specially struck for collectors. Usually mirror-like surface. Sand blast and matte proof in some series. Mint State (MS) – (Mint state 60 – 70) "Uncirculated" and "Mint State" are terms that are many times used interchangeably. MS 70 is considered a perfect coin. Extremely few regular issue coins are considered MS-70 although it is common for new, modern bullion coins to be given a grade of MS-70. The grading standards are different in different countries. The main standards applied outside the United States are presented in the following table. Coin grading is not an exact science. It is a subjective exercise and depends on the qualification and the experience of the appraiser. Industry leaders were extremely concerned that without a standardized grading system, the rare coin industry could face enormous problems. Therefore, on February 3, 1986, the Professional Coin Grading Service (PCGS) was formed and in 1987 the Numismatic Guaranty Corporation. Both associations have the same goal of grading coins. Other prominent grading organizations are the American Numismatic Association Certification Service (ANACS) and the Independent Coin Graders. The grading is usually done by three independent appraisers. A grading finalizer assigns the final grade of the coin and thereafter the coin is sonically sealed in a protective, inert plastic holder known as "slab". Other associations followed and are at present active. This third-party appraisal of a coin's physical condition, backed by a guarantee, and a national network of reputable coin dealers provided an extremely reliable form of protection for rare coin consumers who could then participate in the coin market with greater confidence. The value of coins depends on their rarity. There are several scales which have been developed for the definition of the rarity of a particular coin. The most common are the "Sheldon rarity scale" and the "Universal rarity scale". Balance for checking the weight of gold coins. For most of history, coins were valued based on the precious metal they contain. Whether a coin was actually made by the party as claimed was of secondary importance compared to whether it contains the correct amount of metal – that is, correct weight and fineness (purity). Genuine appearance was simply a convenient shortcut to avoid time-consuming tests in everyday transactions. Gold is denser than almost all other metals, hence hard to fake. A determination of weight and volume is in many cases sufficient to spot forgeries. A coin that is not gold or below the expected fineness will either have the right size but will a lower than expected weight or it weighs right and will be somewhat larger. Most metals that are of similar or higher density than gold are similarly or more expensive, and were unknown in ancient times (notably the platinum group). During the 19th century platinum was cheaper than gold and was used for counterfeiting gold coins. These coins could be detected by acoustic properties. Only two relatively inexpensive substances are of similar density to gold: depleted uranium and tungsten. Depleted uranium is government-regulated, but tungsten is more commonly available and suited for counterfeiting. Alloying gold with tungsten would not work for several reasons, but tungsten plated with a thin layer of gold is a common type of forgery. Bullion coin counterfeits (of all types) used to be rare and fairly easy to detect when comparing their weights, colors and sizes to authentic pieces. This is because the cost of reproducing any given coin precisely can exceed the market value of the originals. However, since about 2015 counterfeit coins are "flooding the market at an astonishing rate" and "it's gotten to the point where even people who deal with coins all the time may not be able to recognize a counterfeit coin right away" (American Numismatic Association (ANA), 2016). The coins consist mostly of tungsten plated thinly with gold, have the correct weight, correct or near-correct dimensions and are professionally produced in China. The weight and dimensions of a coin of .999 fineness such as the Maple Leaf cannot be replicated precisely by a gold plated tungsten core, since tungsten has only 99.74% of the specific gravity of gold. However, forgeries of alloyed gold coins (such as American gold eagle or Krugerrand made from a crown gold alloy with 22 karats = .917 fineness) may have correct the correct weight and dimensions because of the lesser density of the alloy. Such forgeries can be detected testing the acoustic, electric resistance or magnetic properties. The latter method uses the fact that gold is weakly diamagnetic and tungsten is weakly paramagnetic. The effect is weak so that testing requires strong neodymium magnets and sensitive conditions (e.g., a gold coin hanging from 2 m long pendulum or placed on styrofoam floating on water), such tests can be performed without special equipment. Forgeries using gold plated tungsten are also used in counterfeiting of gold bars. Biting a coin to determine whether it is genuine or counterfeit is a widespread cliché depicted in many movies (see The Immigrant (1917 film)). While fine gold is softer than alloyed gold, and galvanized lead is softer, biting coins can only detect the crudest of forgeries and its widespread use is almost certainly a myth. There are well made counterfeit gold coins in circulation. For example, the St. Gaudens Double Eagle omega counterfeit is infamous for its complexity and has fooled many numismatics experts. It is a high relief business strike, and due to the extensive wear on the die, these coins were not made for many years. Another example is the US $20 gold coin ("double eagle"), which has raised lettering around its rim. If the coin is uncirculated, the letters will be flat on top. If slightly rounded, and the coin is uncirculated, it is a counterfeit. There are other counterfeit double eagles in which the gold and copper alloy was not thoroughly mixed. These counterfeits will have a slightly mottled appearance. Coins of the Australian dollar – The $1 and $2 coins are colloquially referred to as "gold coins" because of their colour. ^ "Gold coins – A Brief History". ^ "Monetary Episodes from History". ^ a b "The Million Dollar Coin – a true milestone in minting". Royal Canadian Mint. Archived from the original on January 25, 2015. Retrieved 25 January 2015. ^ a b "Investment Gold Coins". ^ "The Biggest Gold Coin in the World". Perth Mint, Australia. Archived from the original on January 25, 2015. Retrieved 25 January 2015. ^ a b "Information on Coin Specifications". Archived from the original on April 10, 2010. ^ Yeoman, R. S. (2009). A Guide Book of United States Coins (63 ed.). Whitman Publishing. ISBN 0-7948-2766-7. ^ "Grading Standards". Retrieved October 1, 2010. ^ "Rarity Scales". "Rarity System". Archived from the original on August 5, 2009. Retrieved June 3, 2010. ^ Manas, Arnaud. "The music of gold: can gold counterfeited coins be detected by ear?". European Journal of Physics. 36 (4). doi:10.1088/0143-0807/36/4/045012. ^ a b Gray, Theo (March 14, 2008). "How to Make Convincing Fake-Gold Bars". Popular Science. Archived from the original on January 25, 2015. Retrieved 2008-06-18. ^ "Counterfeit gold coins and bars". Archived from the original on January 29, 2013. ^ Sargent, Mike. "Indian Head Quarter Eagles: King of the Counterfeit Gold Coin Series" (PDF). ^ Lafleur, Merlin. "Fake gold bars out of tungsten a counterfeit story". 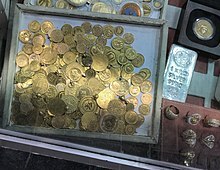 ^ "Why do pirates bite gold coins they are given? (PDF Download Available)". ResearchGate. doi:10.13140/rg.2.2.27019.08487. ^ Roberts, John. "The 1907 High Relief Saint-Gaudens Double Eagle". ANACS. Archived from the original on February 4, 2016. ^ "How Can You Know If Gold is Fake or Real?". 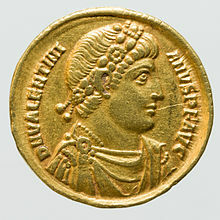 Wikimedia Commons has media related to Gold coin.